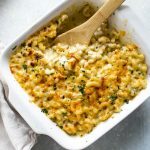 This creamy green chile macaroni cheese with mild cheddar and Monterey jack cheese starts on the stovetop and finishes under the broiler and is the best kind of cold weather comfort food. Boil the macaroni for 2 to 3 minutes less than what’s listed on the package. Drain the pasta and place it back in the pot you boiled it in and set it aside. In a 3.5-quart pan, melt the butter over medium-high heat. Add the green chile, with all the juices, and stir to combine it with the butter. Lower the heat to medium and cook the chile with the butter for a minute or so. Sprinkle the flour over the green chile and butter. Stir and cook the flour for three minutes or so. The mixture should turn to a thick paste. Slowly add the milk and half and half whisking continuously until smooth. Keep adding the milk in batches, whisking continuously, until the sauce is smooth. Add the salt and stir. Place the onion wedge and smashed garlic cloves in the sauce. Cook the sauce over medium heat until it starts to thicken and coats the back of a spoon, about five to ten minutes. You don’t want the sauce to boil so adjust the heat as needed. Once the sauce is thickened, discard the onion and garlic. Add 1 and 1/2 cups each of the shredded cheeses in batches, stirring continuously until it’s melted and the sauce is smooth (reserve 1/4 cup of each cheese for topping). Add the chopped cilantro and stir to combine. Pour the sauce over the cooked pasta in the other pot. Stir to evenly coat the pasta with the sauce. Transfer the macaroni and cheese to an 8×8-inch baking dish and sprinkle the remaining shredded cheese over the top. Place an oven rack in the top spot and turn on the broiler. Transfer the baking dish to the oven and broil the mac and cheese until the cheese on top is bubbling and a golden crust forms.